Microsoft has unveiled its new Surface tablet today. The new tablet will come in two flavors running a version of Windows 8. The first is a 10.6-inch, 9.3mm thick Surface tablet powered by Windows 8 RT and equipped with an ARM processor made by Nvidia. It features front and back HD cameras, a tough Gorilla Glass 2 made ClearType HD capacitive touchscreen display, built-in kickstand, an all-magnesium VaporMg-made Liquidmetal chassey construction. 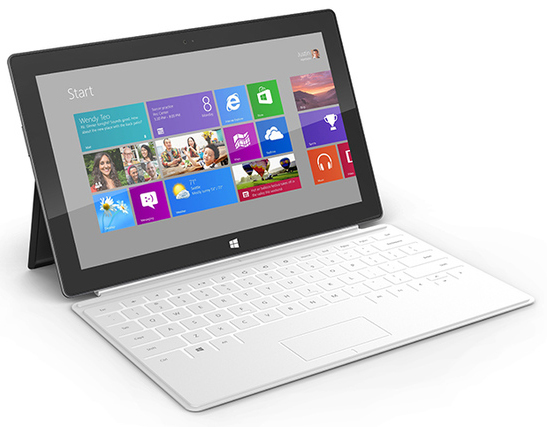 The Surface tablet with Windows 8 RT will come in 32GB and 64GB capacities. Microsoft's second Surface tablet model will by powered by Windows 8 Pro, boasting a nearly identical design albeit with a thicker profile at 13.5mm-thick with an Intel Ivy Bridge Core i5 processor, a full 1080p HD 10.6-inch display and a bigger battery under the robust magnesium enclosure. Also, it'll come in larger storage capacities than the Surface tablet running Windows 8 RT, with 64GB and 128GB capacities. Microsoft has also managed to pull of an Apple move in introducing some Smart Cover-like accessories for its two Surface tablets while improving greatly on Apple's magical tablet cover. The Touch Cover is a 3mm thin, pressure sensitive cover that doubles as a fully functioning Multi-Touch keyboard and trackpad. It magnetically connects to the Surface tablet ala-Smart Cover, with a single magnetic clicking connection. And what do you know, it'll come in five vibrant colors. And if you prefer a more traditional, clicky keyboard cover, Microsoft gottchya back with its Type Cover. It's slightly thicker at 5mm thick, and also features a Multi-Touch trackpad. Microsoft hasn't announced any details on pricing or availability yet. Full Surface tablet spec lists, video and more tablet goodness after the break!